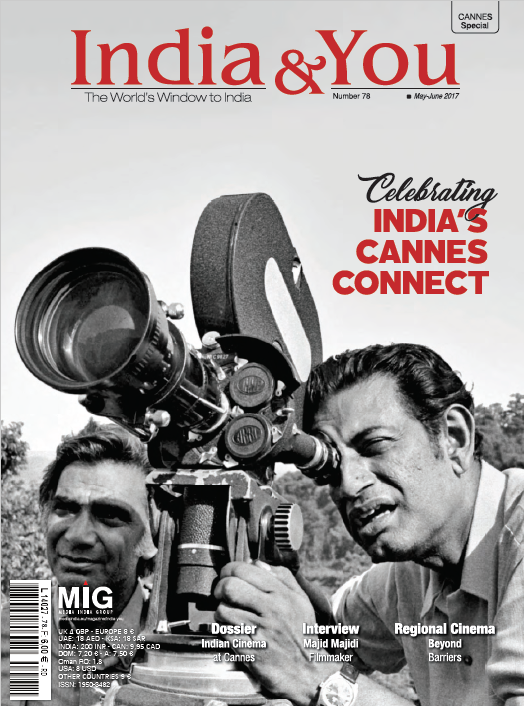 The Cannes Film Festival 2017 is around the corner and so, here we are with the May-June 2017 issue of India & You magazine focusing on India’s Cannes connect. Giving you a taste of 70 years of Indian film industry at Cannes, we take you through interesting anecdotes from the Indian cinema business. Documenting the journey of various filmmakers and industry insiders who shed light on the art of filmmaking, the business it generates, challenges and the sense of creation that spurs them on, we also take a closer look at the ills of censorship, prospect of independent cinema and the realities of documentary films; from gender issues still prevalent in the country to the surreal world of the animation industry. Explore the connect between India and Europe with following the journey of how Europe became the favourite destination of Bollywood. And finally, towards the end of your read, know about the Bollywood beauties who made fashion statements with their bold outfits at Cannes. Happy reading! Indian animation speaks a language of its own. It has a life of its own and an acceptability that knows no borders. Over time, the Indian animators have evolved a style that always suits the story even as the presentation remains their very own; creating an appeal that is universal while the DNA remains intrinsically Indian. Bollywood is investing heavily in recce and scouting for quintessential frames. From Switzerland to Greece, be it iconic songs or romantic scenes, the industry has left no stone unturned in capturing the extraordinary beauty of Europe over the years, thus, contributing substantially to the tourism boom. Cinema in India has come to be synonymous with Bollywood, yet, independent cinema that is highly expressive is challenging the narratives despite being plagued with challenges. The world’s second largest population belongs to India, with an estimated 30 pc of the 1.33 billion people under the age of 15. Also, India produces the most number of films in the world. Yet, there is hardly any notable tailor-made content being produced for children. Why don’t the numbers add up? A 13-minute film from a third year student of Film and Television Institute of India (FTII) is the nation’s only official entry to the Cinéfondation section of Cannes Film Festival 2017; here’s a tête-à-tête with the director, Payal Kapadia, who shot the film quintessentially on celluloid to keep the colours natural for a story inspired from the life of her grandmother. With the advent of cinema in India, while most filmmakers chose to project the fading grandeur of Indian princely states or reprise historical fables, Guru Dutt used the medium to capture the loneliness of his characters and present a critical point of view of the Indian society during the 1950s and early 1960s.